Although the process of drug development requires efficacy and toxicity testing in animals prior to human testing, animal models have limited ability to accurately predict human responses to xenobiotics and other insults. Societal pressures are also focusing on reduction of and, ultimately, replacement of animal testing. However, a variety of in vitro models, explored over the last decade, have not been powerful enough to replace animal models. New initiatives sponsored by several US federal agencies seek to address this problem by funding the development of physiologically relevant human organ models on microscopic chips. The eventual goal is to simulate a human-on-a-chip, by interconnecting the organ models, thereby replacing animal testing in drug discovery and development. As part of this initiative, we aim to build a three-dimensional human liver chip that mimics the acinus, the smallest functional unit of the liver, including its oxygen gradient. 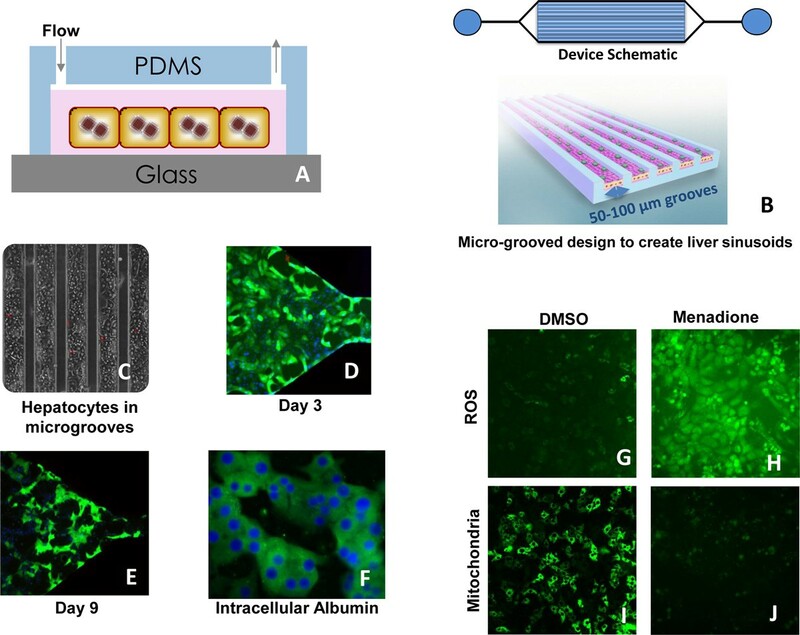 Our liver-on-a-chip platform will deliver a microfluidic three-dimensional co-culture environment with stable synthetic and enzymatic function for at least 4 weeks. 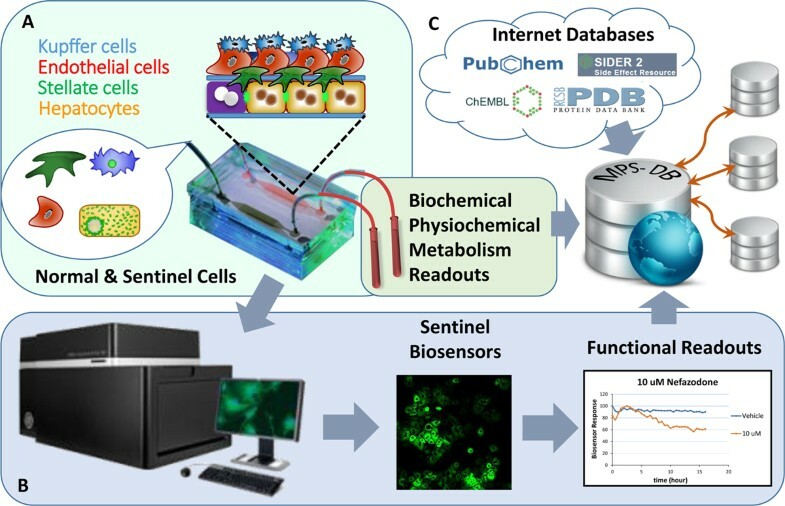 Sentinel cells that contain fluorescent biosensors will be integrated into the chip to provide multiplexed, real-time readouts of key liver functions and pathology. We are also developing a database to manage experimental data and harness external information to interpret the multimodal data and create a predictive platform. The liver is the largest metabolically active organ and is important in the modification and detoxification of external agents, but is also susceptible to damage from these substances  and their metabolic intermediates. Liver toxicity and cardiotoxicity are the most cited reasons for both market withdrawal and failure during late-stage clinical testing of drugs [2, 3]. Current animal models, as well as in vitro liver platforms, are poor predictors of human liver toxicities, with success rates as low as 40% [4, 5]. The pharmaceutical industry is therefore in need of better tools for predicting these toxicities in early stages of development in order to reduce dangerous clinical outcomes and drug development costs. Thus in 2011 the National Institutes of Health, through the National Center for Advancing Translational Science, the US Food and Drug Administration, the Environmental Protection Agency and the Defense Advanced Research Projects Agency, announced a collaboration to develop microphysiological systems that model major organs of the human body. Key requirements for these models are: to facilitate the assessment of biomarkers, bioavailability, efficacy, and toxicity of therapeutic agents prior to clinical trials; and to predict the safety, efficacy, and pharmacokinetics of drug/vaccine candidates prior to their first human use. As participants in the National Center for Advancing Translational Science program, our laboratories at the University of Pittsburgh and at Massachusetts General Hospital are collaboratively developing a three-dimensional microfluidic human liver acinus with integrated fluorescent biosensors to improve prediction of human liver response to xenobiotic insults (Figure 1). Fluorescence-based protein biosensors can detect altered levels of specific analytes and changes of subcellular protein localization with spatiotemporal resolution in response to drugs or external stimuli [6, 7]. The platform comprises four vital cell types of the liver (hepatocytes, endothelial, stellate and Kupffer cells) arranged layer by layer with well-defined cell numbers and organization in a three-dimensional microfluidic environment mimicking a hepatic cord. A subset of hepatocytes and nonparenchymal cells (NPC) integrated into the device are biosensor sentinel cells, expressing fluorescence-based biosensors of key cellular functions in order to provide quantitative, real-time reports of cell health and molecular modes of action . This approach seeks to extend the predictive relationship between hepatotoxicity triggers (mitochondrial damage, activation of Kupffer cell, oxidative stress) and the final manifestation of drug-induced liver injury (DILI) to long-term and real-time dynamics . Since DILI can manifest as both acute and chronic effects, our liver platform is being developed to function for at least 4 weeks; a significant technical challenge considering the rapid de-differentiation usually observed for primary cell cultures. Another key component of our approach is the development of a database application that will access information from major drugs, drug targets, bioassays and pathway databases. Related chemical, bioactivity, preclinical and clinical data will be used for aiding the interpretation of microphysiology readouts and development of computational models to predict the safety and toxicity of new compounds. The database design aim is ultimately to integrate the other microphysiological organ systems to complete a human-on-a-chip database. Liver acinus module with microchip. (A) The liver acinus module with a microchip, including a diagram of four liver cell types and sentinel biosensor cells layered in the device. (B) High content analysis of microchip device and quantitation. (C) Graphic depiction of data from device and external sources supplied to database. The liver comprises two major cell populations: parenchymal cells (hepatocytes) and NPCs, including endothelial cells, stellate cells and Kupffer cells among others. The inspiration for our platform is the liver sinusoid and the acinus, the smallest metabolic functional unit of the liver. There are four crucial aspects of liver physiology captured in our design: a three-dimensional architecture; multiple cell types; physiological microcirculation; and zonation. A model that aims to recapitulate the intricate autocrine and paracrine interaction between different cells of the liver should include the major parenchymal cell and NPC types as well as a three-dimensional microcellular environment mimicking the acinus-sinusoid . The three-dimensional architecture shaped by the collagen sandwich in tissue culture plates was an important development in the long-term stable metabolic and synthetic function of hepatocytes . Co-cultures of liver cells can extend the stability and function even further, as well as modify the response to drugs as compared with monocultures of hepatocytes [12–14]. Kupffer cells, for example, are known to contribute to DILI during acetaminophen toxicity . These co-cultures can also stabilize cells after unavoidable injury . Recent results show that both human and rat hepatocytes are stable for over 3 months in a co-culture with their respective NPC fraction, with improved response to drug induction of clinically relevant cytochrome P450 enzymes , highlighting the importance of a co-culture over standard monocultures. Further, arranging the co-cultures into sinusoid-like structures improves albumin secretion and cytochrome P450 activity for over 2 months . The latter is important as evidence suggests reactive metabolites are often the cause of unanticipated DILI. Evidence further confirms that three-dimensional co-cultures, either on a scaffold or as a spheroid, improve both the longevity and toxicological response [12, 17, 18]. Microcirculatory flow can also modulate the response of hepatocytes  and of endothelial cells , and can form the oxygen zonation that is important for site-directed injury and the transport of nutrients and waste metabolites. However, when exposing cells to flow, it is important to emulate physiologically relevant conditions including appropriate shear stress, drug residence times, and chemical gradients. The microfluidic approaches allow for such emulation as well as providing high-throughput test beds for pharmacokinetic and toxicity studies. The exact molecular basis for many instances of DILI is unknown. A major goal of our project is to identify real-time functional responses associated with hepatotoxicity using sentinel cells . We are developing the sentinel cells of various cell types to respond to several molecular signatures that are associated with hepatotoxicity . Based on our previous experience with biosensors, we are developing hepatocyte sentinel cells to report metabolic alterations due to apoptosis, oxidative stress, phospholipidosis, and intrahepatic cholestasis caused by inhibition of bile efflux transport, among others [7, 23, 24]. Kupffer cell activation in response to the injury trigger will be used to measure immune dysfunction that occurs as a result of reaction to a drug, a drug metabolite, or a protein altered by a reactive drug metabolite . Stellate cells will have biosensors to monitor proliferation that results from fibrosis associated with cholestasis or mitochondrial failure . Cells placed in the chip are also confirmed for intermediary metabolism. Our vision is to use a microfluidic device where the hepatic and sentinel cells are arranged in parallel microgrooves in a sinusoid-like architecture (Figure 2A,B,C) . The cells at the inlet of these channels consume oxygen, which generates an oxygen gradient along the flow direction of the device. Previous work on microfluidic liver(s)-on-a-chip used feeder cells to stabilize cultures, but lacked long-term functional data and had no incorporation of NPCs in a three-dimensional architecture [28–30]. Although bioreactors include longer culture times and multiple cell types, they are not suited for microfluidic format . Our strategy is to seed the hepatocytes and add the NPCs sequentially. The cells will be proportioned in appropriate physiological ratios of 70 to 80% hepatocytes, 15 to 20% endothelial cells, 5 to 10% stellate cells and 5 to 10% Kupffer cells. Preliminary results. (A) Diagram of flow conditions for hepatocytes in collagen gel in the microfluidic device. PDMS, polydimethylsiloxane. (B) Microfluidic channels 50 μm wide, 10 mm long, and 100 μm tall with grooves to represent a liver sinusoid. (C) Phase image of primary hepatocytes in a microgrooved channel . (D), (E) Live primary rat hepatocytes stained for live (celcein)/dead (ethidium homodimer-1) cells at days 3 and 9. (F) Fixed primary rat hepatocytes stained for intracellular albumin (anti-rat albumin antibody; Abcam, Cambridge, MA, USA). (G), (H) Primary human hepatocyte sentinel cells expressing reactive oxygen species (ROS) biosensor treated with dimethylsulfoxide (DMSO; control) or 100 μmol menadione for approximately 4 hours. (I), (J) Primary human hepatocyte sentinel cells expressing mitochondrial function biosensor treated with DMSO (control) or 100 μmol menadione, approximately 16 hours after addition of treatments. Our initial prototype for cell culture and parameter optimization is a cell culture chamber 10 mm long, 1.5 mm wide, and 100 μm tall, fabricated out of poly-dimethylsiloxane . In preliminary work, approximately 12,000 seeded hepatocytes demonstrated stable hepatocyte functionality for 10 days of culture under a static (no-flow) condition, showing excellent viability (Figure 2D,E). Although the device incorporates human cells, preliminary device optimization was carried out using primary rat liver cells. Similarly, polydimethyl-siloxane used in prototypes will be replaced with more robust materials. The functional data are supported by periodic cell viability assays as well as visualization of the intracellular albumin (Figure 2F). A novel concept in our vision is to integrate multiple live, stable, and nondestructive cellular reporters of test drug effects to enable the early prediction of DILI using high content analysis. A subset of primary human liver cells is efficiently transformed into sentinel cells by lentiviral gene delivery of fluorescent protein biosensors. Long-term high content analysis can be carried out within the microfluidic device without the need for offline analysis  (Figure 1). The sentinel cell data are quantifiable to assess the toxicity, metabolic functions, and key modes of action responses to drugs over time. Initial studies of sentinel cell primary human hepatocytes report increased reactive oxygen species (Figure 2FG) and mitochondrial impairment (Figure 2H,I) in response to known hepatotoxins versus a vehicle control. Importantly, these responses are time and concentration dependent, reproducible, quantitative and collected by nondestructive techniques. Sentinel cell data will be integrated with biochemical and metabolic measurements to monitor drug clearance and cytochrome P450 induction, glucose consumption, and urea and albumin secretions. The sentinel cell concept will advance the field because it enables the study of primary cell heterotypic interactions due to drug response and enables the study of dynamic cellular response from within a functional liver model. Central to the liver model, and indeed all of the organ models, is the organization and analysis of large and complex datasets to predict human organ efficacy and safety . We are constructing a database application to collect, manage, and analyze data from the real-time readouts, biochemical assays, and mass spectrometry. Beyond data management, the database will incorporate access to clinically relevant hepatotoxic and nonhepatotoxic drug exposure results, and biochemical and metabolic activities in order to establish the concordance of the liver chip data with in vivo effects. To achieve this goal, a selection of reference compounds with available clinical data will be profiled in the liver chip, and the resulting dataset will be used to construct predictive models of human hepatotoxicity. We are particularly interested in using the liver acinus module to investigate DILI, which leads to pathologies such as fibrotic scarring, fatty liver disease, reduced metabolic detoxification, and even liver failure . An important cause of DILI is human genetic variability that can lead to altered liver metabolism and response to drugs. Our long-term goal is to seed the liver microchip with induced pluripotent stem cell-derived adult-like hepatocytes to characterize and predict hepatotoxicity arising from distinct genetic backgrounds. Since our liver acinus module is modular and reconfigurable, we plan to combine it with other organ platforms to begin assessing multiorgan toxicities. Key elimination organs that have direct interaction with the liver, such as the gut and kidney, are of particular importance because they can provide robust pharmacokinetic modeling. This plan fits our goals of: generating a microscale platform technology to support human physiological organ systems; maintaining the liver module at high, stable levels of function for at least 4 weeks; and utilizing real-time high content measurements and a reference database to improve the prediction of human liver toxicity. Finally, sentinel biosensor cells can be developed for other organs and the general design of our database application is adaptable for other organ models. Abhinav Bhushan, Nina Senutovitch contributed equally to this work. This work was supported in part by the National Institutes of Health Common Fund 1UH2TR000503 (to DLT and MLY, co-principal investigators). Publication costs are funded by the National Institutes of Health, National Center for Advancing Translations Science under grant 5UH2TR000503-02 to DLT.